It is illegal to use growth hormones for the production for milk in Canada. In some countries, Bovine somatotropin (a growth hormone), is used in dairy cows to increased their metabolic rate. This increases the cow's milk production. If a cow gets sick and needs medication to get feeling better, all of the milk that is produced by that cow is no longer legal for sale. This milk does not enter our bulk tank and is not fit for human consumption. In addition, all of our milk gets tested before it leaves the farm to ensure that there is no antibiotic residues in the milk. If there is residues in the milk, the milk must be dumped and is not shipped for public consumption. Dairy farmers are also severely fined for shipping milk to the processing plant if it contains antibiotic or hormone residues. 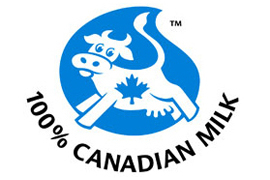 Meadow Lynn Farms is taking part in the Canadian Quality Milk Program (CQM). This program promotes on-farm food safety by keeping track of our actions to prevent food safety hazards. All of the milk produced on-farm is also tested for antibiotic residue when it arrives at the processing plant. Any milk that is found to have residue is not sold to the public and farmers are fined for not meeting the quality standards.